TWO pregnant horses and a stallion were left to fend for themselves in a ‘dumping ground’ after their owner ditched them in a field to graze. A black stallion Friesian, named Eli, and two bay thoroughbred pregnant mares, Sophia and Duchess, were so under-fed their ribs were clearly visible and their bodies skinny. 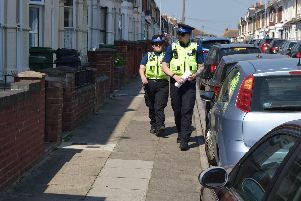 All three had been left on land to fly graze by Joshua Pedelty, 30, of Allaway Avenue, Paulsgrove, who this week was convicted of neglect at Portsmouth Magistrates’ Court. In a prosecution brought by animal welfare charity the RSPCA he was found guilty and fined £300 – and handed a three-year ban on keeping any types of horses. The three horses had been rescued from the Causeway, off Sussex Road, in Petersfield in June 2018. RSPCA deputy chief inspector Sandy Barlow, who investigated for the animal welfare charity and worked alongside field officers from World Horse Welfare to rescue the horses, said: 'Fly-grazing of horses is a big issue, and can lead to welfare problems. Often the land used for fly-grazing is unsuitable for horses. Pedelty must pay a £300 fine and £1,000 costs. He denied three charges of causing unnecesary suffering to an animal under the Animal Welfare Act. Photos of horses neglected by Josua Pedelty, who was convicted at Portsmouth Magistrates' Court. Pictured is Duchess before she was rescued. But Portsmouth magistrates convicted him of all three charges on Monday. His ban was suspended for 28 days. Photos of horses neglected by Joshua Pedelty, who was convicted at Portsmouth Magistrates' Court. Pictured is Eli before being rescued.